Description About the size of an apple seed and have a leathery, flattened body with two antennae, six legs and no wings. Bed bugs are seeing a resurgence in Canada and even the cleanest of homes can fall victim to these painful pests. At night, bed bugs feed on sleeping humans, but by day, they hide in dark undisturbed areas like inside furniture, baseboards, floorboards, carpets, and even wallpaper. Bed bugs are attracted to the carbon dioxide and warmth that humans emit, which makes them particularly drawn to multi-unit buildings with lots of turnover like hotels or rental apartments, where they are often brought in on luggage or used furniture. They are known to travel more than six metres from hiding in order to feed, but generally hide within two metres of their host, in large infestations that give off a sweet but unpleasant smell. How worried should I be about bed bugs? Bed bugs multiply quickly, with females laying up to 500 eggs in her lifetime. 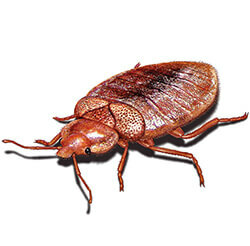 In just six months, a few of these pests can turn into a full-on infestation of more than 13,000 bed bugs. Adults can also survive for a year without feeding, so even if you leave, they might not. Since bed bugs are such good hitchhikers and often hide in hard to reach areas the best way to truly rid yourself of bed bugs is often professional pest control. Orkin Canada uses specially trained bed bug dogs, to detect anywhere live bed bugs and their eggs are hiding – and uses customized control strategies to make sure they're gone for good. How can I prevent bed bug invasion or infestation?